Alliances had precipitated many of the large scale conflicts of the half century before Bandung. In Korea, troops from the UN Security Council had rushed to the defense of South Korea from an incursion by Soviet-backed forces. And, of course, not a decade before, the world had divided along the schism of axis and allied in the bloody battles of World War II. Now, with the lines between the capitalist nations of the First World and the communist powers of the Second World drawing more and more distinct, the countries of East Asia were caught in a rather paradoxical bind. Though each state wanted to promote its own independence, especially against encroaching Western powers, doing so might only be accomplished by the formation alliances between Asian states. 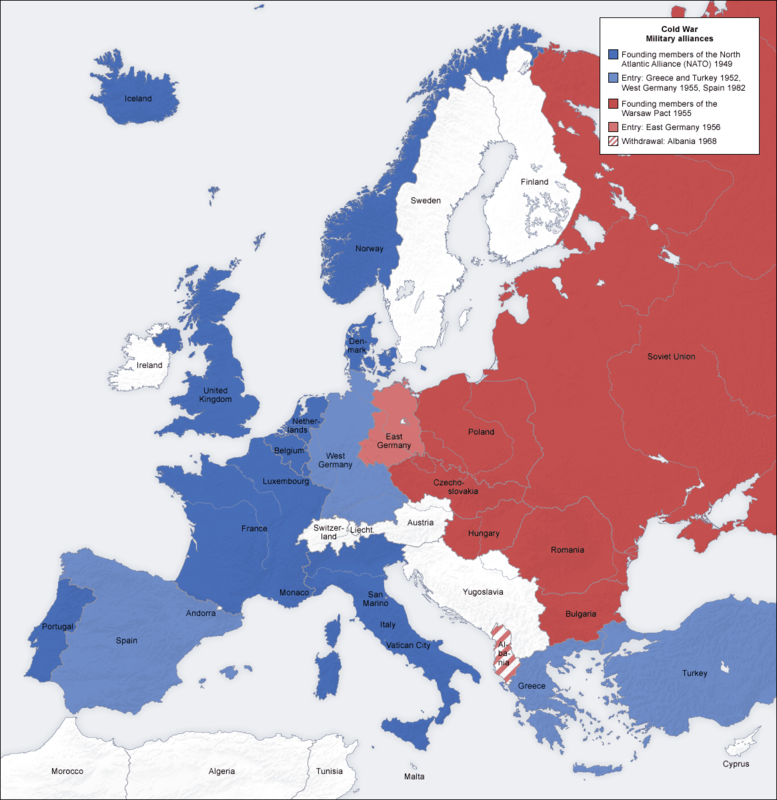 A map showing regions of alliance during the Cold War period in Europe. With such large, power-hungry players next-door, Asian countries had significant cause for concern. And thus comes the rhetoric of the Bandung conference: a rejection of the sprawling power structures of the First World and Second World states, but an intimated apprehension that without a united coalition of Asian interests growing European power conflicts might undermine the Afro-Asian domain. Calls for greater moral concern and the preservation of self-determination underpinned protectionist anxieties. Many of the countries represented at the conference had been recently freed from colonial rule and did not intend to become colonized again, this time by US-dominated capitalist or Soviet-propelled communist influences. They wanted independence. Freedom. They demanded the international equality of nations. But in a sense, they were demanding personal power. The power to determine their own destinies, and not be driven by the interests of a foreign bloc. President Sukarno of Indonesia stated in his speech to the delegates, that the Bandung conference represented “a new departure in the history of the world”. In a sense, he was completely right. Here we see the movement toward an independent and powerful Asiatic realm. One might argue, the rise of a tri-polar world. Tl;dr: Korea was in shambles. Europe was a checkerboard of capitalism and communism. And many Asian countries feared being split along these ideological battle lines. The moral grounds on which members of the Bandung conference rejected the diplomacy of the bi-polar players in the Cold War veiled a fear that without an alliance between Afro-Asian countries, these nations would lose their autonomy to foreign influence.